China is making major headway in its mission to land a rover on the moon — a big step forward in the nation's ambitious lunar exploration plans. At China's Xichang Satellite Launch Center, the moon-bound Chang'e 3 spacecraft is undergoing its final tests ahead of a planned launch in early December. Meanwhile, a Long March 3B carrier rocket, reportedly modified with new technologies and improved reliability, is set to reach the launch center via train from Beijing on Friday (Nov. 1). As for the rover's name, that is to be decided next month, based on nearly 190,000 entries on two China-based websites. According to the Beijing Times, "Yutu" ("jade hare" in Chinese) leads the list, while "Tansuo" ("explore") and "Lanyue" ("catch moon"), are the second and third choices, respectively. China space watcher Bob Christy of the informative website Zarya.info told SPACE.com that his best estimate for a China lunar launch is Dec. 1. "It could be a day or so later, but is unlikely to be earlier," he said. Christy has taken a look at the launch windows. "For Dec. 1, the optimum launch time is around 14:00 to 15:00 UTC (9:00 a.m. to 10:00 a.m. EST)," he said. "It allows Chang'e to approach the moon from the north to give a better view of the transfer orbit from China than would the alternative — around 22:00 UTC (5:00 p.m. EST) for an approach from the south." Sunrise over Sinus Iridum commences Dec. 14, Christy added, so landing will probably be a day or so later to ensure enough light. "I have a Chinese document that says Chang'e will spend about 10 days in orbit before landing. Transit time is likely to be 4.6 days … so it points to Dec. 1 for launch," he said. 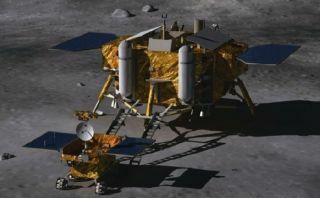 As for why China chose Sinus Iridum for the landing site, David Kring, senior staff scientist at the Lunar and Planetary Institute in Houston, has some ideas. In an informal briefing document provided to SPACE.com, Kring showed the scientific advantages of selecting that region. But he also said that other factors may also have affected the landing site choice. Sinus Iridum is an impact crater, measuring roughly 146 miles (235 kilometers) across, that was later flooded by basaltic lavas. It is located along the northwestern edge of the Imbrium basin. In 1970, the then-Soviet Union's Luna 17 spacecraft landed nearby, dispatching the Lunokhod 1 moon rover, Kring said. The six-wheeled robot sports navigation and panoramic cameras. The lower front portion of the rover carries hazard-avoidance cameras. The rover will hibernate at night and might survive three lunar nights (three Earth months). The rover totes a robotic arm with an Alpha-Proton X-ray Spectrometer, or APXS. That APXS tool could, among other duties, study recent impact crater material that’s been tossed out and about, revealing the material below the moon’s surface; look at ejected debris in crater rays and/or in secondary craters; and help researchers develop a better model for impact cratering processes, Kring said. NASA's new arrival, the Lunar Atmosphere and Dust Environment Explorer (LADEE) probe — what can it sense about China's Chang'e 3 mission? The Chinese rover also appears to be outfitted with a ground-penetrating radar instrument. If so, that device can test models for regolith thickness, including rock abundances inferred from orbiting radar experiments, like the Diviner lunar radiometer experiment on NASA's Lunar Reconnaissance Orbiter. Also, China's rover could demonstrate the utility of ground-penetrating radar to advance future exploration of the moon, Kring said. In Kring's review, the Sinus Iridum mare basalt has modest titanium-ore content, except near its southeastern margin, where it has very high titanium-ore content. One interesting side story involves NASA's Lunar Atmosphere and Dust Environment Explorer (LADEE), which recently entered orbit around the moon. Whether the LADEE spacecraft could detect certain activities of China's Chang'e 3 mission is worth contemplating, according to SPACE.com contacts familiar with LADEE operations. Also in a wait-and-see mode regarding how China's lander/rover operations will perform is Arizona State University's Mark Robinson, the principal investigator for LRO's Lunar Reconnaissance Orbiter Camera, or LROC. "If Chang'e 3 is successful, everyone is pointing to a north Sinus Iridum landing spot," Robinson told SPACE.com. "I keep seeing east central Sinus Iridium near Laplace A [crater] as the target — nothing official." Because that rumor has been floating about for more than a year, the LROC imaging team has made sure the camera has gotten the best possible coverage of the prospective landing locale, Robinson said. Before-and-after imaging is possible, he added, "and it will be fun to watch the rover move away from the lander, perhaps heading to Laplace A, which is a very spectacular crater."